Swimming is one of the most readily available activities in Northern Idaho. With a multitude of lakes, picking which lake to go to is the biggest difficulty. Favorites include Honeysuckle Beach, Independence Point, Sanders Beach, and Q’emiln Park. There are many hiking trails in the area with varying levels of difficulty. Be sure to pick one that fits your abilities, watch out for wildlife, and be aware of hunting seasons. Hiking can be substituted for snowshoeing in the winter. Fishing is a favorite pastime of many locals. Everyone has their place to go, but a couple popular places include the Spokane River and Fernan Lake. Hunting is also a big deal in the area. Be sure to get your fishing and hunting license before going and watch out for private property! Boating adds another element of fun to the lakes. Sailing is popular on Coeur d’Alene and Pend Oreille Lakes, but other watersports, such as skiing, wakeboarding, and tubing are also attractions. Skiing, wakeboarding, and tubing are all welcome on other lakes and the Spokane River. Other activities include kayaking, canoeing, and stand up paddle boarding. Coeur d’Alene Cruises happen year round for a multitude of events. Among the popular cruises is the Eagle watching cruises in the Spring and the Christmas Cruises in the Winter. These cruises are hosted by the Coeur d’Alene Resort. Ziplining is a daring adventure, allowing you to zip through the trees and over canyons. 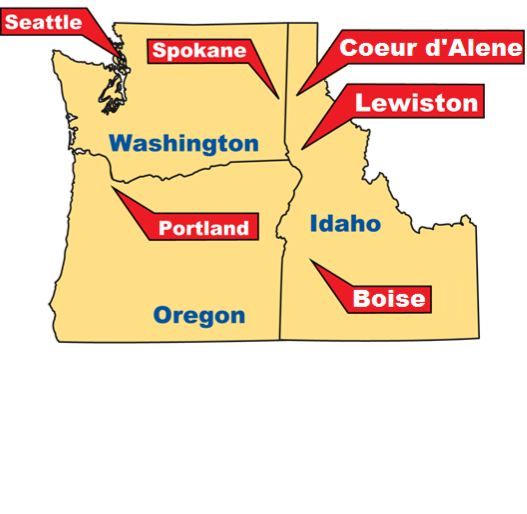 Enjoy the guided tours knowing that the guides are experts and will take good care of you (Coeur d’Alene & Wallace). Whitewater Rafting is a fun adventure with the best rafting is on the Spokane River (WA), Clark Fork River (MT), and Salmon River (Lewiston). Be sure to have a guide and always wear life jackets! There are many local Skiing/Snowboarding mountains. Favorites include Silver Mountain, Schweitzer, Lookout Mountain, and Mt Spokane. Sledding hills can be found in every town, be sure to ask friends, family and neighbors about the ones near you. Ice Skating is available in downtown Spokane and Frontier Ice Arena in Post Falls. Spokane’s arena is outdoors, open November through February. Frontier Ice Arena has limited public skate times, check their online schedule for times. Ice Fishing is available on a several of the smaller lakes, but be sure to take every safety precaution while on the ice.